Today’s blog offers an in-depth review of the UI Integrity Act and related legislation, focusing on the claims response issues. The legislation is generally viewed as being threatening, when this is not necessarily the case. We offer our view on how integrity-related legislation impacts our clients. The amount of erroneous unemployment benefit payments is unacceptably high, and some of the responsibility for this falls on the employer community. Poor and late responses by employers or their agents tend to result in benefits being approved and paid when a disqualification should have been imposed. This results in more appeals of initial determinations being filed, unnecessarily burdening the appeals system. 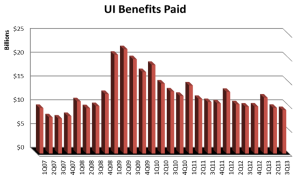 When benefits are paid erroneously, it is quite difficult for the state UI agencies to recover the overpayments, and often they are never recovered. As early as 2005 the state unemployment agencies began monitoring the problems created by employers and their agents who submitted inadequate and/or late responses to unemployment claim forms. Wisconsin was one of the early states to independently establish a penalty (denial of relief from charges), beginning in 2006, on employers who submitted late or poor responses. Exacerbating the problem was the fact that some third party administrators had instituted the practice of responding to unemployment claims in an automated fashion, providing very little detail. Thomas & Thorngren’s practice has always been to provide detailed responses, including documentation, crafted by professional claims analysts, and this has proven to be a great asset for our clients in the eyes of the state agencies. A surge in the number of UI claims occurred in the first quarter of 2009, putting significant stress on the state UI agencies. Benefit year earnings. This refers to benefits continuing to being paid after a person has returned to work or found a new job. Work search issues. Generally this refers to claimants receiving benefits when they have not met their obligation to actively search for work and be available for work. An Executive Order from President Obama in November of 2009 addressed the need to reduce improper payments in major federal programs including unemployment compensation. On June 10, 2011 the U.S. Department of Labor issued a DOL Program Advisory to all state unemployment agencies, notifying them that the DOL was “making an immediate call to action to all state administrators to ensure that UI integrity is a top priority and to develop state specific strategies to bring down the UI improper payment rate. Similar federal legislation had been introduced as early as 2006, with no success. This time the UI provisions were inserted in the Senate, and received no attention in the floor debate about the bill because of the other major policy issues addressed in the bill. The UI Integrity Act gave states a two-year window to enact legislation consistent with the new federal law. State legislation was generally required to be in place by October 21, 2013. Here is an example of how the provisions of The UI Integrity Act come into play. An employee is discharged for misconduct and files a claim for unemployment benefits. An initial claim form is mailed to the employer but the employer fails to respond with information regarding the reason for separation. For this reason, the claim is approved and benefits are paid. The employer receives a determination indicating that benefits are approved, and the employer decides to appeal the determination. An appeals hearing is held, and the appeals decision ultimately disqualifies the claimant. In the meantime 10 or 12 weeks have elapsed since the time the claim was filed, and the person has received benefits erroneously during this time. Even though the claimant has been disqualified, the employer’s UI tax account will remain charged with the 10 or 12 weeks of benefits that have already been paid, if there is a finding that the employer (or the employer’s agent) has established a pattern of failing to respond timely or adequately. If a determination is made that an employer (or agent) is at fault for failing to respond timely or adequately to a request for information, the employer must be given the right to appeal such a determination. The U.S. Department of Labor provided the state UI agencies with guidance on the new requirements. The guidance gave the state agencies considerable flexibility in administering these provisions. Each state was required to develop its own definition of what it means to establish a pattern of failing to respond timely and adequately, including the period of time involved. The states have the authority to impose even stricter standards if they wish to do so. For example, a state law could deny relief from charges after the very first instance of a failure to respond timely or adequately, and fifteen states now have such legislation in place. Sixteen states now have the authority to deny the employer the right to appeal an adverse determination if the employer submitted an inadequate or late response to the initial claim form. Further, six states have the authority to impose monetary penalties on the employer. We expect the UI Integrity Act and related state legislation to have a long-term positive impact on our clients. The integrity-related legislation is designed to shift the cost burden of improper payments to the employer that contributed to the improper payments, i.e., the employer that submitted an inadequate or untimely response to a UI claim form. Without such legislation, the nonresponsive employer can be granted relief from charges and funding of the erroneous benefit payments becomes the collective burden of all employers in the state. When the nonresponsive employer is granted relief from charges, the UI benefits are nonetheless paid to the claimant, and funds are withdrawn from the state UI Trust Fund. These improper payments become a socialized cost, accounted for in the tax rate tables and adjustment factors used in rate calculations. This is detrimental to our clients, who are committed to processing UI claim forms responsibly. We are supportive of legislation that encourages the assessment of improper benefit payments to the employer that contributed to the payments. This is healthy for the experience rating system, the UI program in general, and our clients in particular. It has always been sound business practice to focus on providing a complete, detailed response to the initial UI claim form and to include supporting documentation. This avoids unnecessary appeals that can be costly in terms of time spent by supervisory personnel. Our company is focused on providing effective claim responses by coordinating with our client in the most efficient way possible, given your organizational structure. This collaborative approach now provides even more opportunity to reduce UI taxes in the current environment. Check back for more on human resources, payroll, insurance and benefits specifically for nonprofits. This entry was posted in In the News, Solutions and tagged employer’s tax account, UI integrity Act, unemployment claims. Bookmark the permalink.